Big flashy muscles might be attractive but as any physio will tell you, they are next to useless without core stability. Thankfully the health and fitness industry has now started to embrace the need for core stability, but still few people really understand the concept and what it means. Essentially our bodies have hundreds of different muscles that all perform important tasks and the very conspicuous Abs, Glutes, Pecs, Delts and Biceps (amongst others) are there to provide strength but they are supported by a plethora of smaller, less conspicuous muscles that provide stability. These are generically referred to as the ‘Core Muscles’ and the best comparison we can think of is with automotive suspension systems. If the ‘Strength’ muscles are the springs then the ‘Core’ muscles would be the shock absorbers. They are usually less conspicuous, sometimes even hidden within the springs but without them your car would fall apart in no time. The same goes for humans. Good strength muscles alone won’t keep you running smoothly. Without good core stability you’ll be in for lube and servicing (physio) all too often and eventually you’ll be off to the scrap yard before your time! When it comes to spinal stability, the most important muscles are the multifidus, pelvic floor and transversus abdominis. As shown in the image to the right, these muscles form a supportive cylinder around the spine. The transversus abdominis is like a corset around your abdomen and it sits deep underneath all the “six-pack” muscles. It attaches the lower ribs, diaphragm and lumbar spine to the pelvis. This ‘core’ stabilises the spine and allows the load of movement to be evenly distributed between all the intricate joints of the spine. 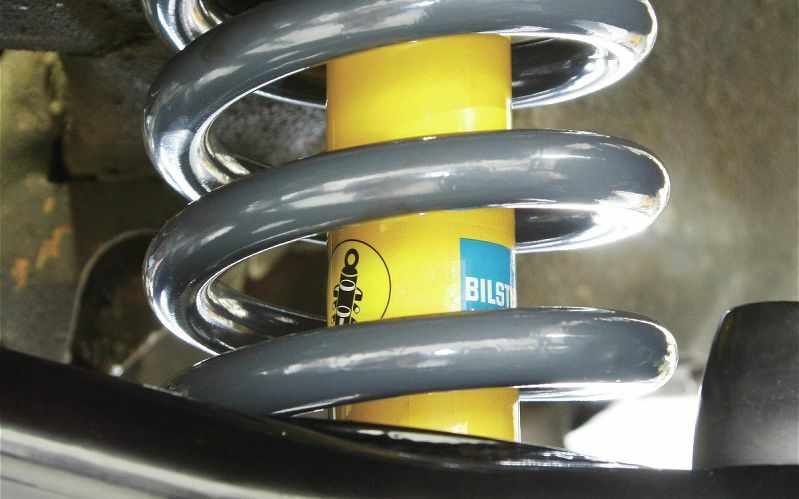 Just like a car suspension system, it reduces the shock through the joints and thus reduces wear and tear which would, over time, lead to conditions such as arthritis or bulging discs. Doing exercises like sit ups is useful to strengthen the big “six-pack” muscles, but doing this exercise without good core stability will lead to excessive load through the joints of the spine and can lead to injury of the spine. So in that respect it is important to activate and strengthen the core before you start on a regime of strength building. Another example is the shoulder. The “delts”, “lats”, “pecs” and “biceps” look fabulous but they are not the stabilisers of the shoulder. Over training of these without attention to the deeper, core stabilisers of the shoulder can result in injury as a result of an increased load being put through the system without the appropriate “suspension”, so to speak. See our blog on ‘Shoulder Stability’ for a series of simple exercises to build core shoulder stability. Each area of the body has a “core” component. Feet have intrinsic muscles that operate in balancing. Ankles rely on hip and foot stabilisers for control. Knees similarly need good hips and feet to be protected. and even Necks have a deep system of muscles that control movement. In essence, the core muscles play a crucial a role in overall well being and strength. Without the stability and control provided by the deeper core muscles, the power and strength gained from training is useless!! Stay tuned as our series of CORE STABILITY blogs will introduce the specifics of core training for different parts of the body and the common areas of overloading we see in fitness regimes! Spinal stiffness and pain is a common complaint. This can be caused by inflammation, arthritis or muscular tightness as well as injuries such as bulging discs. The impact of spinal symptoms can easily be reduced by doing a regular morning stretching session. Generally, I advise my patients to wait 20-30 minutes after rising from bed before they commence spinal stretching. This is to allow the discs to compress slightly after they have been expanding during sleep. This reduces the risk of injury to the discs. Following is a list of great exercises to do in the morning to get your spine moving! Knees to chest rocking: bring the knees to the chest and tuck up in a gentle rocking motion 10 times. Sciatic nerve stretches: using a long belt stretch the leg as shown by gently moving the ankle forward and back, keeping the leg straight. Piriformis and gluteal stretches: place the ankle of one leg on the knee of the other and lift both legs up toward you as shown, hold for 20-30 seconds as you pull the stretching leg toward the opposite shoulder and push into the ankle with the opposite knee. Open book stretch: lying on your side as shown, breathe in as you take your top arm across your body, allowing your head and shoulders to turn with it. Hold the stretch and breathe out. Repeat 10 times both sides. If you spend a lot of time at a desk or do a lot of physical activity such as running and cycling then it is likely that you will have tightness in your hamstrings. Tightness in the hamstring muscle group can lead to knee pain, back pain and can increase the risk of tearing the hamstrings during activity. To effectively isolate and stretch the hamstring muscle group it is crucial that your technique is right. There are a number of different “hamstring stretches” out there but the following video outlines the best way to get a strong isolated stretch into the hamstrings! Let us know your reactions to our blogs – we’d love to hear from you, critiques, queries, compliments all gratefully accepted. Hello and welcome to our first video blog. Its all about core stability, pelvic stability and balance – all three very important to maintaining a healthy balance within yourself. Here’s Angus to demonstrate the exercise. If you haven’t got a Swiss Ball at home then we highly recommend you get one – they are an extremely versatile aid to keeping yourself in-trim at home and to top it all they are great fun to use too. We’ll have plenty more demonstrations of exercises you can do with a Swiss Ball soon. We’re aiming to make a lot more video clips over the course of this year which will be hosted on our Northern Beaches Physio channel on YouTube. So, how are we doing? Did Angus do well? (and no, channel seven, you can’t have him). Do you like our blogs? What would you like to see more of? Use the ‘Reply’ field below to have your say, we’d love to hear from you. Post by Catherine Stephens B. App Sc (Physio) MAPA.